By Toby Simon, YWCA of Haiti. PROVIDENCE – Recently my husband Peter and I returned from a short trip to Haiti. 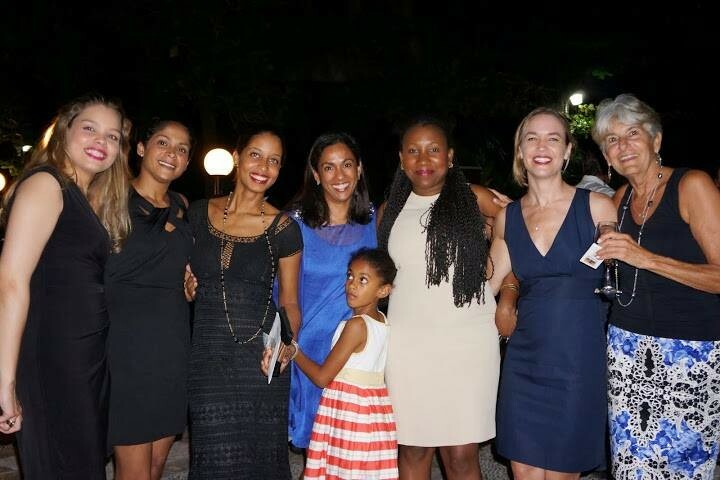 Unlike the vacation we took there a year earlier, this trip had two purposes: to attend the first annual fundraiser of the new YWCA – Haiti honoring exceptional Haitian women and to do some HIV training for health workers. Toby Simon, right, with her Haitian colleagues, who helped start the YWCA in Haiti. Peter and I started going to Haiti in 1995, exactly one year after Bertrand Aristide came back into power. At that time, the mood was upbeat in the very rural Artibonite region near the Hospital Albert Schweitzer where we had been working. The Artibonite River Valley is the breadbasket of Haiti and the stronghold of the Lavalas Party, which had put Aristide into power. The local people we encountered were feeling optimistic about Haiti’s future. Visitors to Haiti, who usually provide either volunteer or short-term paid work, often comment that there is something about the place that gets to you and keeps you returning year after year. That was and still is our experience with Haiti. Although we spent about 15 years doing volunteer stints at the Hospital Albert Schweitzer in rural Haiti, the past four years have been spent in Port au Prince and nearby towns. Peter and I have actually experienced Haiti differently. As a pediatrician working at the Schweitzer Hospital it was unbearable for him to see children arrive at the hospital with preventable and/or treatable illnesses, only to watch them die in the hospital because they didn’t have the reserves to fight their infections. Peter is also a public health physician. He became frustrated with the inability to meet basic needs like potable water, sanitary conditions, decent housing and roads, and how difficult it was to obtain funds to invest in basic infrastructure compared with the ease and “sexiness” of getting funds to treat cholera, HIV/AIDS and to build orphanages. Peter also became tired with the rescue fantasy of some people who knew very little about sustainability and short term investments. Ignorance about the history of our country’s role in Haitian history and present economic and political distress added to his frustration. As a public health trainer and advocate, my experiences were always more rewarding. I had the luxury of focusing on the training needs of small non-profits or large hospitals that were always grateful for the new skills and knowledge that their staffs acquired. Starting a YWCA in Haiti. About four years ago, through some Haitian Bryant University students, I met several remarkable Haitian women who were determined to start a YWCA in Haiti. Records show that there had been numerous attempts to bring a YWCA to Haiti for about 40 years but this time, a small group of dedicated women was successful. Through these women I was exposed to a new generation of Haitians who are intent on making Haiti a better place. They are the ages of our adult children and, for the most part, they grew up privileged. They were educated in the United States and Canada but are the 15 percent of Haitians who actually returned to their country following graduation from their universities. They are lawyers, businesswomen, political appointees, communications experts and event planners. And, in their spare time, they started the YWCA Haiti. They are living proof that Haitian women are the poto-mitan (pillars) of the community. The YWCA-Haiti is an affiliated member of the World YWCA, a global network of women and girls working for justice, peace, health, human dignity, freedom and care for the environment in 122 countries worldwide. Its current objectives are to promote awareness on health issues, education, and to develop leadership skills for young women in Haiti. It also offers a safe space for girls and young women. The YWCA-Haiti’s slogan is “Se ave’m chanjman an komanse” – change starts with me! Based on these now frequent encounters with the well-educated Haitian community in their 30s and 40s, it’s clear that they are committed to social justice issues, women’s rights, gender equity and civic education. They have faith and confidence in the future of Haiti. Compared to the feelings of doom and gloom that usually accompany reports about Haiti, their energy, organizing approach and can do attitude is exciting and hopeful. On this trip we attended the YWCA-Haiti fundraiser in which three exceptional Haitian women were honored: Michele Pierre-Louis, former Prime Minister of Haiti and director of FOKAL, an independent foundation providing a range of educational, human development and economic activities to local communities; Marilia Charlestin, an outstanding entrepreneur who works in the central plateau where she has created jobs for more than 3,000 women; a young emerging leader, Anne-Martine Augustin of HELP, a Haitian organization dedicated to leadership and retaining Haiti’s top talented students. This trip also provided us an opportunity to work and visit at two Catholic hospitals in the Port au Prince area: St. Camille’s and St. Damien’s. Both of these facilities have beautiful grounds, clean corridors, well-ventilated rooms and seemingly happy staff. Both expressed keen interest in providing access to reproductive health services including the availability of condoms, collaborating with the surrounding communities and providing training to their staffs based on adult learning theory. People frequently ask us about Haiti, wondering whether there’s any hope to ending the grinding poverty. Peter often says that each time he returns from Haiti, he feels like he understands less about the place. Stop seeing Haiti as hopeless. However, there are some things he now recognizes. Outsiders have to stop treating Haitians as victims, because that only contributes to a culture of victimization. The work of a majority of the non- governmental organizations (NGOs) does not address the root causes of poverty in sustainable ways. When people are accustomed to free services from these international organizations, the local capacity to provide services is adversely impacted. When the NGOs are providing services, the government often is ignored or is allowed to continue to ignore their responsibility to serve their people. We also have to stop seeing Haiti as a hopeless place. We need to drop the tag line, “The poorest country in the Western hemisphere.” Instead, we need to see Haiti’s assets, her potential. Haitians themselves are resilient, creative, and entrepreneurial. One way outsiders can help Haiti is by visiting as tourists. The next time you want to take a beach vacation, consider Haiti. The beaches in the south and in the north are magnificent. There are many lovely small hotels with fabulous restaurants nearby. True, most Americans would need to hire a driver but this is easy to do and gives you peace of mind. And yes, many things in Haiti take getting used to: the presence of guns, poverty in the streets, unbelievable traffic jams, remnants of the earthquake. However, the vibrant street scene, lack of road rage, exquisite Haitian art, stunning countryside, delicious cuisine, and beautiful people can easily win you over. In this way you can help Haiti: visit the place, stay in their quaint hotels, eat tasty Haitian food in their restaurants, and hire local people as tour guides. Tourism will boost the economy just as it did in the Dominican Republic 30 years ago. Time to give Haiti a try.